Just a minor update to ensure that you can still share flights with FlightTrack! Travel in style! Introducing Media Lounge, a hand-picked suite of content that will make your trip easier and more enjoyable. • Come back regularly to discover the latest selection. Fixes a bug that can cause a blank screen on launch. Said "Goodbye!" to some bugs. 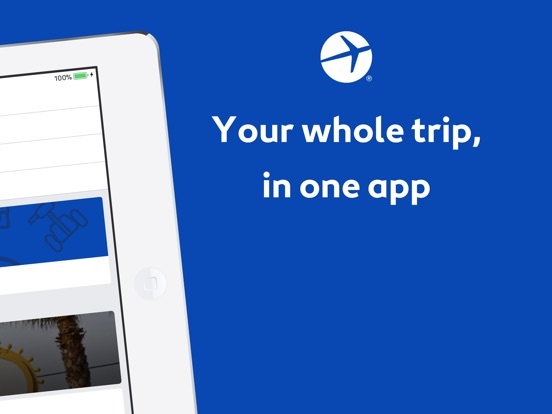 Now you can share your travel plans with friends and family via Facebook, email, and message! No more waiting at Arrivals. 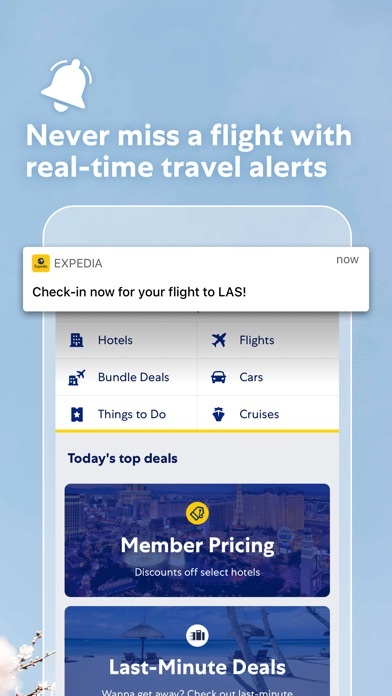 Expedia will let them know if you're on-time or delayed. 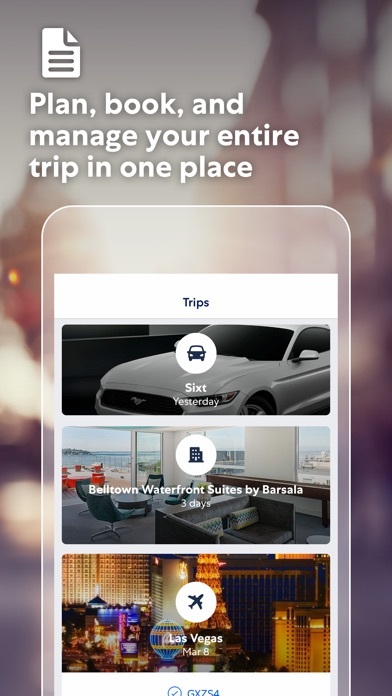 • No more waiting for the app to refresh your itinerary when you open it! 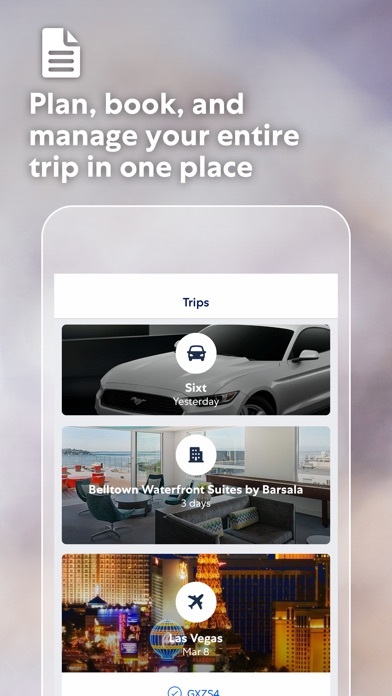 Now we update the app in the background so that you have the latest and greatest travel information upon launch. • Fixed! 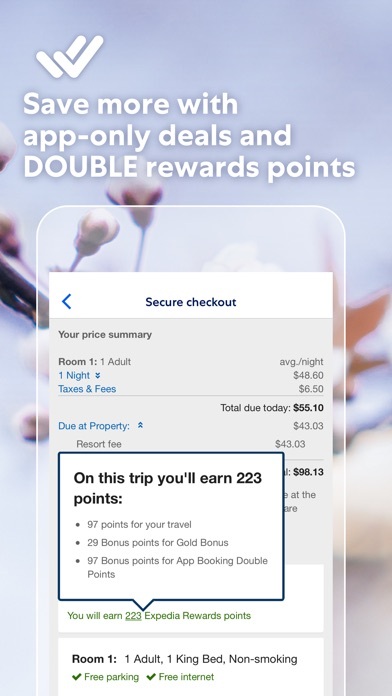 Incorrect check-in date for hotel itineraries. • New! 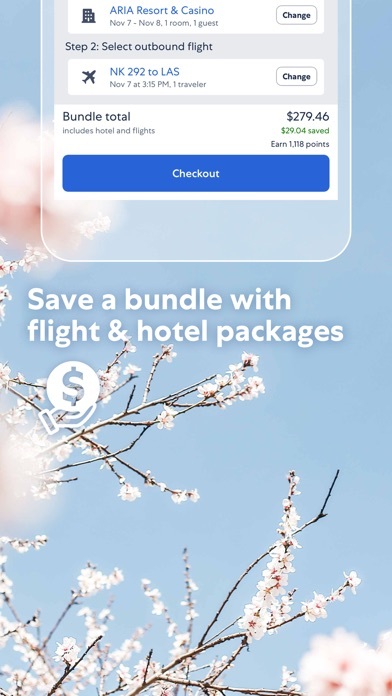 Added Flight booking in Canada! • Fixed! Said "Goodbye!" to some bugs. • New! Log in via Facebook. • New! Added even more hotels around the world. • New! Search for a hotel by name. Find that specific hotel right away. • New! 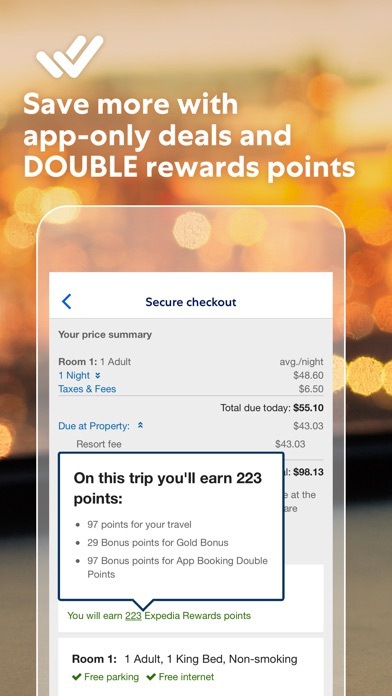 Book a room through the app and add to Passbook from the confirmation screen. • New! Need a deal on a room tonight? We added Tonight Only deals. Enjoy. • New! 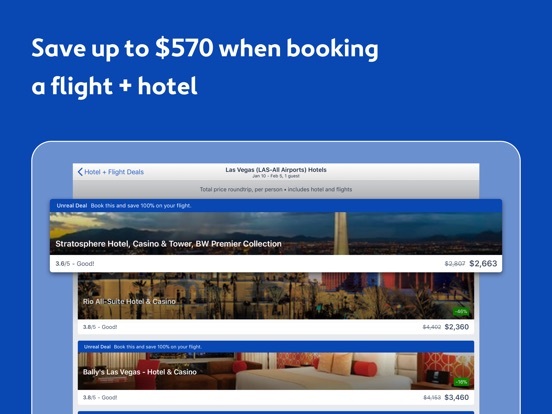 Find the best hotel deals around via the new Sort by Deals feature. • New! A beautiful new look for the iPhone 5 (and all other iPhones too!). • New! Get great Mobile-Exclusive Deals in over 250 cities around the world. These deals are better than what you will see on our website! • New! View full-size hotel images simply by swiping down on the photo. It's a smooth, beautiful experience. * Fixed! Several bugs and stability issues. • New! 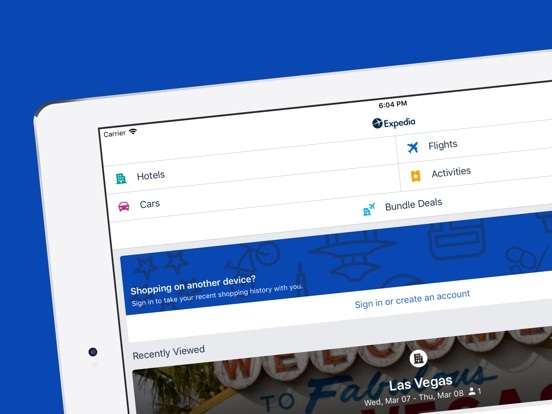 Log in to your Expedia.com account to earn Expedia Rewards and view your app bookings on Expedia's desktop website. • New! 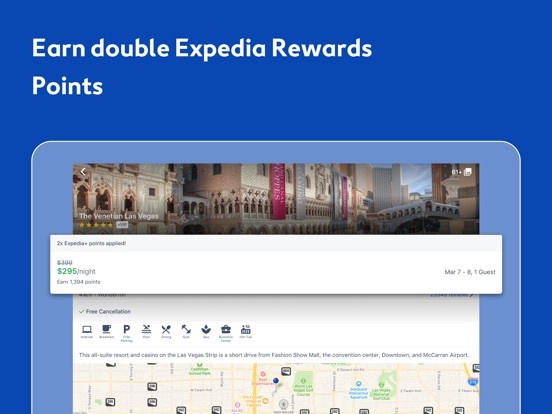 Redeem your Expedia coupons when you book. • New! 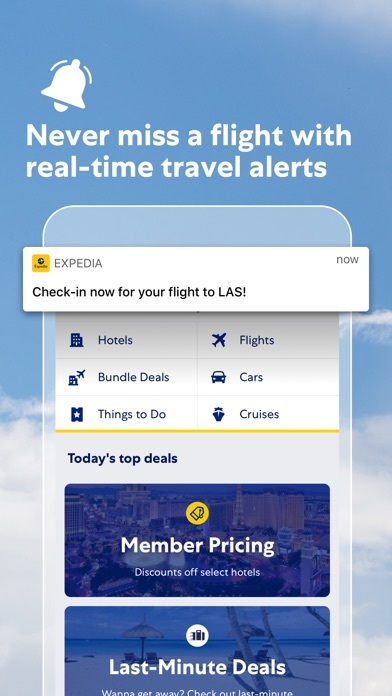 Checkout faster by using your stored Expedia.com credit cards. New! App suggests locations as you type. New! You can search for hotels near places of interest. New! Added hotel reviews in multiple languages. Fixed! Several bugs and stability issues. * New! Made to look even more beautiful for the new iPad with Retina display. * New! Added Thai and Vietnamese localizations! * Improved! 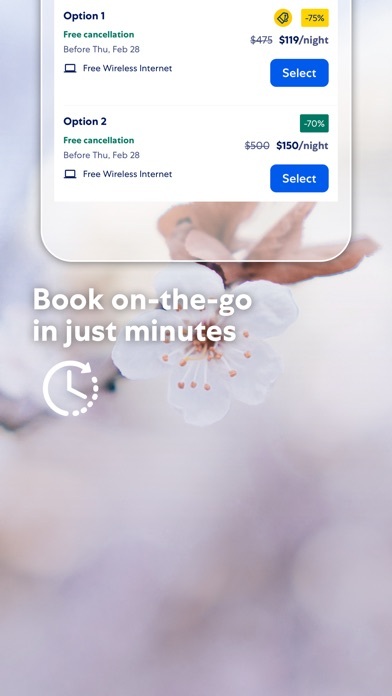 Updated the booking service to ensure best prices and make it easier for you to modify your reservations. • Fixed a checkout bug that affected a small percentage of customers. • Fixed a small text truncation bug in iOS 4 that affected Chinese, Japanese, and Korean languages. • Fully optimized for iPad! We created a new UI specifically for your iPad. 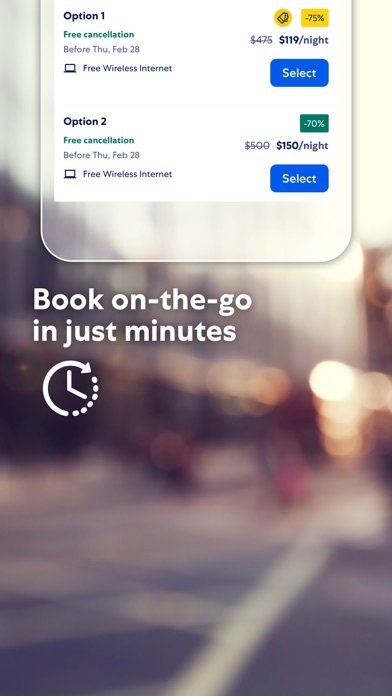 See everything you need to choose the perfect hotel on one screen and then book easily. Don't worry, this has no effect on iPhone and iPod touch users. Fully optimized for iPad! We created a new UI specifically for your iPad. 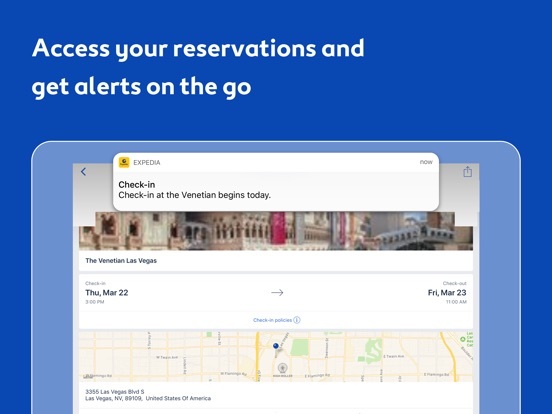 See everything you need to choose the perfect hotel on one screen and then book easily. Don't worry, this has no effect on iPhone and iPod touch users. Thanks again for your support! 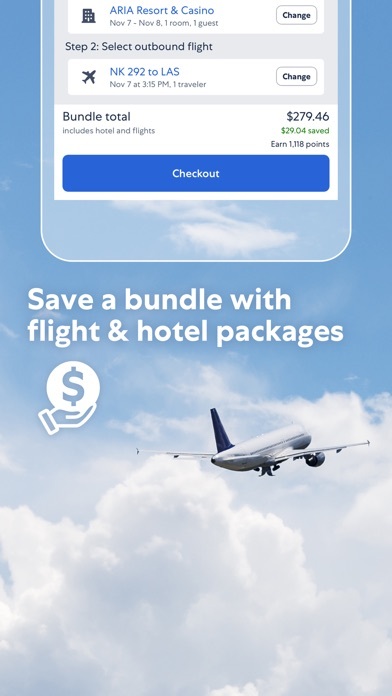 We've optimized Expedia hotels for iOS 5 and added Dutch to the list of languages supported. Better than the actual website! Very easy and user friendly!. I made the booking even faster than on the website. Been using Exp Hotels for a while now, and loving it. Took about 2 seconds to see hotels nearby me, with photos and rates and rating and distance from me. Booking was easy. Booking again a few days later was even easier than easy.